A lot of times in bustling start-ups and small business environments, there is an underlying sentiment, along the lines of “I don’t care how you do it, just get it done.” This can create a strange occurrence in which a uniform process for achieving a goal is not feasible. Instead, members of the organization scramble to create their own individual processes for accomplishing their tasks. Originally, as it may be the first time an organization is encountering these challenges; it may seem as if this Wild West gunslinger policy of creating on the go is advantageous or even agile. However, as time goes by, the team grows, turnover is experienced… the process can become exceedingly difficult to the team at hand, and the manner in which it is accomplished can be as varied as the members of the team themselves. As an emerging business, it is best to get a hold of these processes early on in their development stages and define learnings that will not only benefit your team as a whole but will instill a knowledgebase on how to approach these particular tasks for years to come. Certain department members are running circles around others, making them look bad. How are you going to alleviate this? When people take positions they often come in with an assortment of prior experiences. Though just being around successful people on the job can permeate positive skill building. It does not create a clear delineated pathway to ensure the enrichment of the entire department. When one person is doing well, the business does alright but is capable of much more. When everyone is doing well, the business is truly capitalizing on its resources. Installing a Training and Development program with social components can go a long way in capitalizing on this diverse collection of experiences. Allowing for the organization itself to develop a roadmap on how to train people in the future, as well as identifying important areas in which employees need to focus for the betterment of the business. In your organization, do you feel that you give your employees enough time to dip their toes in the rippling waters of their position? Or, do you just start them immediately on tasks without any familiarity with where available resources reside, positional strategies, or established communication channels both within and external to the organization itself? You would probably not be surprised to know that many upstart companies subscribe to the policy of immediately holding their new employee’s feet, directly to the flame. Instead, imagine a world where when you bring somebody on, they will undergo their required certifications and training, and know exactly how the role is comprised on the organizational level. Something they can only estimate in their own perception and often without the entirety of scope. In a training environment, these valuable assets will be more prepared for their roles, quickly, and they can go about implementing serious and long-lasting change with much fewer barriers to entry. A training and development program not only makes onboarding clients easier, but it alleviates the pressure of turnover experienced along the way, as the next person in will quickly be able to obtain working knowledge of the position and the tasks it includes. One of the biggest adversaries to augmenting employee skills is the drive for personal improvement. This can be seen in employees who already believe they have a grip on their role and are unwilling to accept positive criticism to become even greater within their position. The benefit of establishing a training and development program is that calculated measures can be placed that will allow you to address some of these concerns. Not only can you guarantee that these users are exposed to appropriate methodologies, but you can also ensure how they are absorbing the information. This can be achieved through establishing a learning environment that is specifically designed to meet their needs. By utilizing all the tools at the disposal of the organization; various methods of communicating information can be presented, tested, and measured to promote an atmosphere of continuous learning. The role of Human Resources is exceedingly difficult in these small environments. As there are few established guidelines for safeguarding the brand, and many programs are not nearly as mature as they need to be. By seeking out practices to best benefit the organization, it is also vital that auditable delivery methods are established. By developing a learning and development program with the output of certifications, you can not only confirm that someone has undergone their required training, but you can also adhere to human resource procedures and quickly mature the department. A trained employee is a productive asset for your organization. When processes are documented and the entirety of the representatives are trained, odds are the speed in which their tasks are accomplished will rapidly increase. In small business and start-up cultures, these changes in speed can equate to the lifeline required to continue as a profitable business and thinking up newer more creative methods to stay afloat. A training and development program also signifies to employees that their company is willing to invest in them as well as the business itself. This can go a long way in establishing a learning culture, and incentivizing employees to continue down the path with the organization. 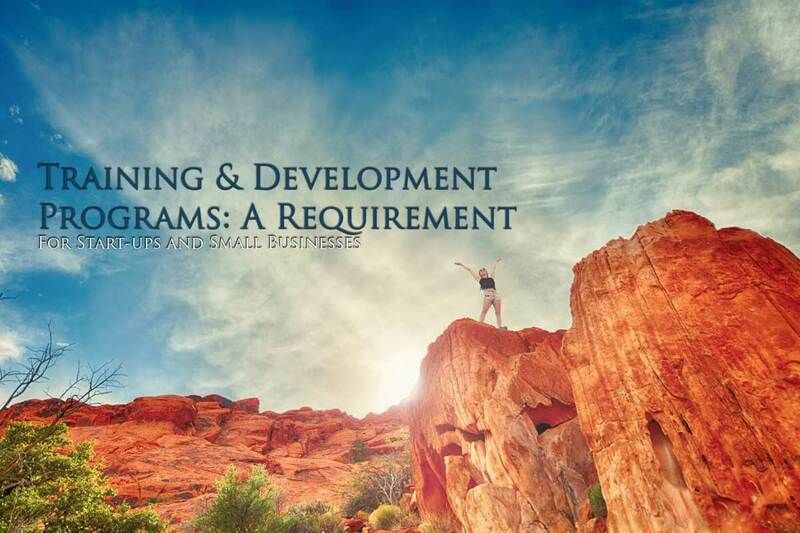 Though it may seem like an obvious solution, a successful training, and development program requires a certain level of commitment regarding time and resources that small organizations and startups do not always feel that they have. However, establishing the processes of an organization, finding more effective means to onboard, train, and implement these effective processes can immediately lead to a higher growth rate of an organization. Taking the guess work out of how an up-and-coming business goes about procuring more business and interacting with potential clients is exactly what the Doctor ordered. Join me as I continue to explore the Learning and Development landscape, addressing how it impacts businesses, organizations, and learning institutions of all varieties here at the Gyrus Blog.